The ashes still not settled when it burned up the box-office in May of this year, the action thriller Iron Man 3 slams into home theaters in a Blu-ray combo pack. The movie with its HD Master Audio transfer from the theatrical release can shake the family room with the right equipment. The movie cashed in with over $1billion ticket sales from around the globe and with the home release entering the video market; it may be this year's biggest winner. In this sequel of Iron Man we find Tony Stark has invented a new way to put on his impenetrable suit of armor and has a room full of new metal fashions that have special features. He's on top of the world living with Pepper Potts (Gwyneth Paltrow) the love of his life in his home and new production quarters of Stark Industries. Flash back to the 1990's at a science convention where we are introduced to Maya Hansen (Rebecca Hall), a scientist and number one girlfriend of Stark. Upon entering an elevator, Stark gets confronted by inventor Aldrich Killian (Guy Pierce) wanting a meeting to show him his new invention. The elevator stops at his suite and Stark makes the mistake of sloughing him off. Flash back to today with Pepper running into Maya at Stark Industries. Maya wants to chat with her, but Pepper's not up to it. A moment later Pepper gets led to a meeting with the now wealthy Killian. I the boardroom Killian uses a special device to show her his newest creation that will help develop and can control the human brain. In the meantime, an ugly Middle Eastern despot The Mandarin (Ben Kingsley) has reared up in defiance to the United States Government's killing of innocent people in his county. He has vowed to kill the president and do the country mortal harm. When Iron Man swings into action and his side kick Colonel James Rhodes (Don Cheadle) gets caught up in an insidious plan to blow up the USA, the fate of the world hangs in the balance. I was sold on last year's Marvel team with The Avengers, but Iron Man raises the bar on comic book heroes. Writer/director Shane Black hangs it all out with some very creative scenes filled with non-stop action and thrills. Using some extremely nice computer imaging techniques he adds wonderment and awe with amazing graphics. The most startling scene to me shows Stark's house coming apart floor by floor, walls collapsing and cement blocks breaking to pieces as they tumble into the sea, it's a jaw dropping action feast. We are treated to one incredible CGI scene after another on a roller coaster ride that has an incredible finale. As the antagonist Guy Pierce gives a sinister performance as Killian who's trying to outwit the man of iron. He's intimidating in his quest to take control of the world building his creatures that do his explosive bidding. Looking to settle a grudge and prove Stark should have met with him after the meeting in the elevator, his character is relentless in turning up the heat. The Blu-ray Combo pack has a good measure of Extras, but for this title the rabid fans may be somewhat disappointed in the amount of content. Being Iron Man is top dog of Marvel's Avengers; I was expecting at least another hour of how the film was made. "Marvel One-Shot: Agent Carter" this quick adventure shows Agent Carter going on a perilous mission in an action filled short. Hmmm, I can see a feature coming some day in the future. "Audio Commentary by Shane Black and co-writer Drew Pearce" I liked this commentary as it adds some quick wit along with the creativity of the script. "Iron Man 3 Unmasked" this behind the scenes feature moves along at a quick pace laying out the facts behind Iron Man 3, but could have been way more elaborate. Being a huge fan of the iron super hero, I'm sitting here waiting for round two. Well, maybe in Iron Man 4. "Deconstructing the Scene: Attack on Air Force One" I liked this feature that takes apart one of the most awesome moments in the movie. It may be only a few minutes, but if you are a CGI lover than sit back and enjoy. "Deleted and Extended Scenes" Unfortunately it looks like they just wanted to extend the bonus features here with a LOT of extraneous scenes that would not have worked in the film. "Exclusive Look at Thor: The Dark World" Call this an extended 2 minute trailer of the upcoming Thor adventure to be released this year. I can't wait. "Gag Reel" I actually like this little feature. It remands me of the small mistake snippets that are played during the credits of many films these days, only more adult intended. "Restore the Database Second Screen Experience" It's a scavenger hunt that takes some gaming skill so you will probably have to get your teen to help you do it. The superiority of the sound using the DTS-HD Master Audio 7.1 plays theater quality dialogue and special effects clean and clear. If you have a sound bar or upgraded sound system it has enough power to give the feel you are in the first row of a movie theater. The visual projection is very good with the HD quality 1080p presentation providing excellent imagery as close to theater class as any Blu-ray can. The colors are vibrant and the blacks amazingly good. Even the finale with Iron Man fighting in the dim lighting comes across clear. The HD sharpness will be equivalent to anything you can show on your HD Television. Iron Man 3 has been rated PG-13 by the MPAA for sequences of intense sci-fi action and violence throughout, and brief suggestive content. You may want to check the film out yourself however, as the intensity of the violence may be inappropriate for young children. 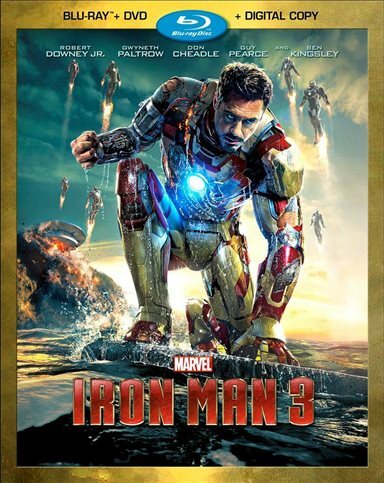 Download Iron Man 3 from the iTunes Store in Digial HD. For more information about Iron Man 3 visit the FlickDirect Movie Database.